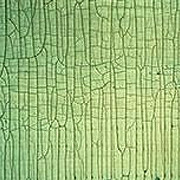 Patterned cracking in the paint film resembling an alligator’s scales. Cracks may affect only a single layer of paint and may not reach the surface. May begin as slight cracking or “checking" and can eventually grow wider and deeper, breaking through top and bottom coats. Noticeable wide breaks can appear over the entire surface in the worst cases. Scrape or sand the paint down to the bare surface or use a chemical paint remover. Dust masks or respirators and eye protection are recommended for safety. If using liquid removers, be sure to wear long sleeves and gloves. Remove all dust and allow the surface to dry completely. Prime the surface with a high-quality latex primer and let it dry completely. Apply a high-quality paint in the desired finish.